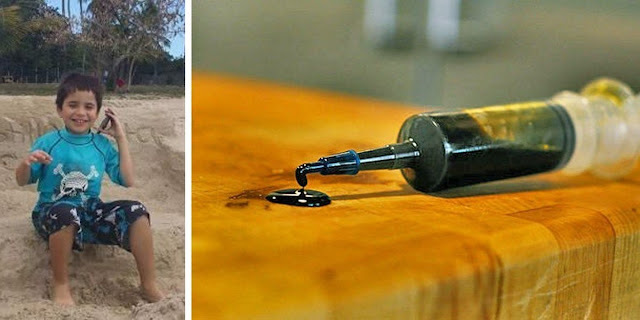 This Autistic Boy Gained The Ability To Speak After Only 2 Days Of Cannabis Oil Treatments! From birth, Abiel and Gladys Santiago of Puerto Rico knew something was not right with their son, Kalel. At 10 months old, he was diagnosed with neuroblastoma, a type of cancer, which he beat with chemotherapy and radiation treatments, as well as surgery. Then, shortly after, he was diagnosed as severely autistic. "While he was in the hospital, we noticed he didn't speak at all and had some behavior that wasn't right, like hand flapping, and walking on his toes," his father Abiel Gomez Santiago told Yahoo News. "But we waited until he was 3 and cancer-free to look at his behavior." The Santiagos set out to teach their older boys, 18 and 20, all about autism and what to expect. They also sent Kalel to various schools and put him through different types of therapies before finding a great deal of success with a surf-therapy school near their home. Then the Santiagos tried something unconventional: a CBD oil. Through a fundraiser, Gladys and Abiel were able to procure a small bottle of cannabidiol oil, or CBD oil. Kalel was given two oral doses twice a day. Two days in, he spoke for the first time in his life. “He surprised us in school by saying the vowels, A-E-I-O-U. It was the first time ever," Abiel said. “You can't imagine the emotion we had, hearing Kalel's voice for the first time. It was amazing. The teacher recorded him and sent it to my wife and me and we said well, the only different thing we have been doing is using the CBD." Soon after, he mastered consonants. “He said, 'amo mi mama,' 'I love my mom,'" Abiel says. “I don't know how to thank [the CBD oil makers]." Kalel's story is just one more in a sea of examples of how marijuana can help people in need. Please SHARE This Story With Your Friends & Family..